Have you ever had one of those weeks? You know the ones I'm talking about. At the start it seems like it should be an easy, low stress week. But then BAM. From day one, it slaps you in the face. That was last week. I'll spare you too many details and just give you a quick recap, which I'm sure won't do justice to the amount of stress the week's events created. Things started with a battle between our truck and a railroad crossing arm. You know the ones that come down to keep you from hanging out on the railroad tracks when a train is headed your way. And it wasn't my husband or myself driving the truck. I still haven't decided if that is making it harder or easier. All I know is that since we got the estimate to repair the damage, I get a sick feeling when I think about how much it will cost. Especially when I realize paying to fix the truck could pay for a trip to Disneyland instead. My baby Bean starting preschool also hasn't been easy. In spite of how tough she was the first day, when Thursday came she cried when I left and then burst into tears again the moment she saw me at pick-up time. I am very much NOT looking forward to tomorrow morning. My little Bean also got sick at the end of last week to add to the stress in her own little life. We were out of town, visiting my grandparents, so she ended up in a single bed with me with a miserable fever. We were both up off and on as her little body fought the infection. Then there's my little Rowdy boy. On Wednesday I noticed his eye looked a little bloodshot. Then when I was running that afternoon, I kept hearing a strange noise and finally turned off my music. That funny noise was the little guy yelping every time he rubbed his eye. 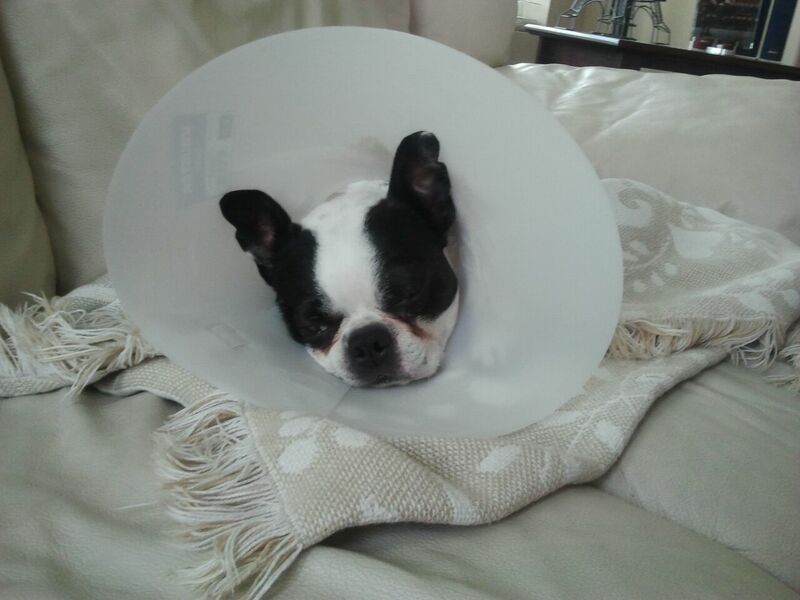 I called the eye specialist who he sees every six months for his cataracts - the reason he is almost blind - and she suggested I get a cone (of shame, as The Princess calls it) to get him through the night. Then we headed up to the office the next morning, where we found out Rowdy has an ulcer in one eye and his cataract has progressed and he now has glaucoma in the other eye. Initially the doctor said there was a good chance they would need to remove both eyes. So we spent the afternoon contemplating whether or not to have his eyes removed. Fortunately his eyes responded to medical treatment, and we are now administering seven different medications to him each day. But we find out Thursday if the meds are working like they should and what the next step will be. It has been hard to see him in so much pain and to feel so powerless to do anything about it. Besides the bigger stresses of the week, there were other small things that happened and some crazy busy days thrown in to add to the chaos. I actually got up early to run several times, which is HUGE for me because I will take every minute of sleep I can get. But I can honestly say my runs helped me get through the week. And I am sure there will be more early morning runs in the future. It was actually really nice to start the day running and be able to cross that "to-do" off my list. 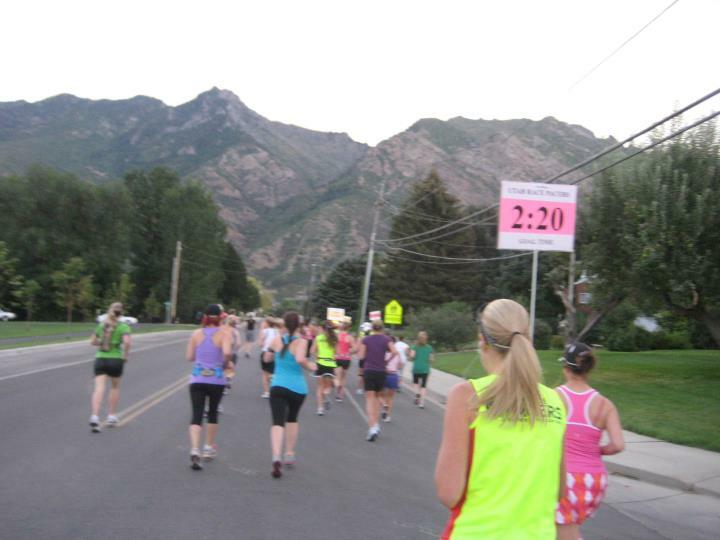 I capped off the week with another half marathon as a pacer. 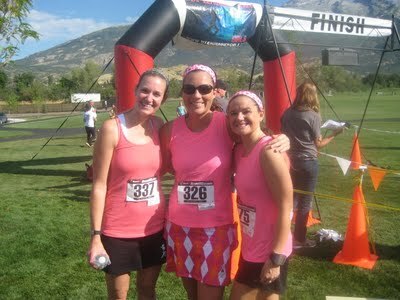 I paced the 2:20 group at the Utah Runner Girls Half Marathon. It was nice to run with very little pressure. I waved to all the runners and bikers I passed and made the most of it. Even with the hilly course, the 2:20 was an easy pace to maintain. I finished a little early, but I learned even more about how to keep an even pace and how to pace in general and look forward to doing it again in the future. Julia took this pic of me in my Utah Race Pacers shirt just getting things started! Julia and Rachelle ran it too. Be sure to read their race recaps. Julia ran with some friends, and Rachelle won the whole thing! Here are a few photos I stole from them because all my pics from the race are on the hubs' phone and he's at work. Needless to say, I was absent from the blog world for the most part last week. I really miss you guys. I feel so out of touch. But things are calming down and life is settling into a schedule and routine, so I'll be catching up soon. Oh, big hugs for you and Rowdy boy!! Watching your dear pet in pain is awful. I hope he recovers quickly and you don't have to make any hard decisions about him. My oldest was the child at preschool that they had to literally *peel* off of me, screaming and crying (him, not me. Until I got in the car.) I fretted daily about that kid and now he's a gregarious and self-confident 8th grader. It gets better, I promise. And last but not least - you ROCK! Pacing two halfs back-to-back? You are amazing! Wow, what a crazy week. This week will be better. I am sending healing vibes for Bean and Rowdy. I hope they are both feeling better. Man, what a week! I hope your dog feels better soon and can maybe keep one eye! Oh my gosh!! Your poor dog!!! I am so glad that his eyes responded to treatment!! Aww...don't worry. Preschool will get easier for your little one. Sounds like there were a lot of crazy weeks in blog land last week. Hope you have a better one this week! Hugs my friend! I am sorry life has been so trying lately. Hang in there. Wish I lived closer and could come take you to lunch or help out some way. Hugs! Ahhh Candice I am so so sorry! I hate weeks like that. It is like they really just need to end so you can start all over. I am crossing my fingers for your dog, that is just terrible. It was really fun to see you Saturday and I think you are a really great pacer. You seemed so calm and relaxed when I ran past you. Great job! I'm glad Rowdy eyes are responding well to the treatment. Hope is better soon. It's sounds like all you girls had a great race. I wish I lived closer so I could of joined you all. I hope things slow down a little soon! Poor Rowdy sounds like a tough situation. Being a pacer sounds awesome, though! Wow, what a week. I don't envy you :-( It's so hard to drop kids off at school when they don't enjoy it and poor puppy. Great work on the pacing though - I can't imagine doing a half at this stage, let alone doing it easy!!! LOL! Something to aim for! I hope your doggie is feeling better. There is not much worse than seeing your beloved pet in pain. :( Sending good vibes your way! !